Below you will find a series of paintings and photographs depicting industrial scenes from 19th century south Wales. Artists were already capturing the Welsh landscape by the late 18th century in what was the beginning of the so-called "Romance period" of painting that reached its zenith during the Victorian era. Although artists like J.M.W. Turner, Samuel and Nathaniel Buck and Henry Gastineau, were better known for their depictions of romantic castle ruins and the like, these and other artists also captured industrial landscapes in the decades prior to the advent of photography. As such, their work became an important historical record for the transformation of rural south Wales into an industrial powerhouse, due primarily of the large-scale production of iron and coal. The paintings and photographs below are presented in thumbnail format and are accompanied by short descriptions of the subject matter. Simply click on the thumbnail to open a larger version of the image. 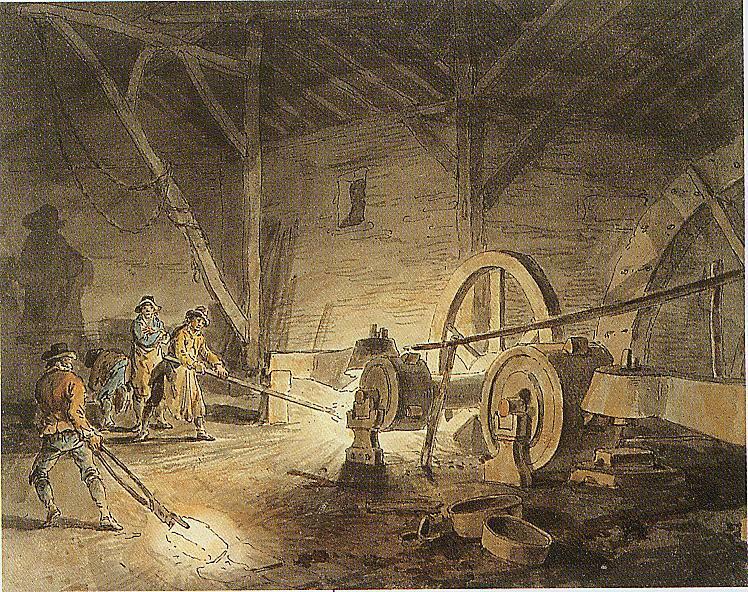 An Iron Forge at Merthyr Tydfil, Julius Caesar Ibbetson, 1789. 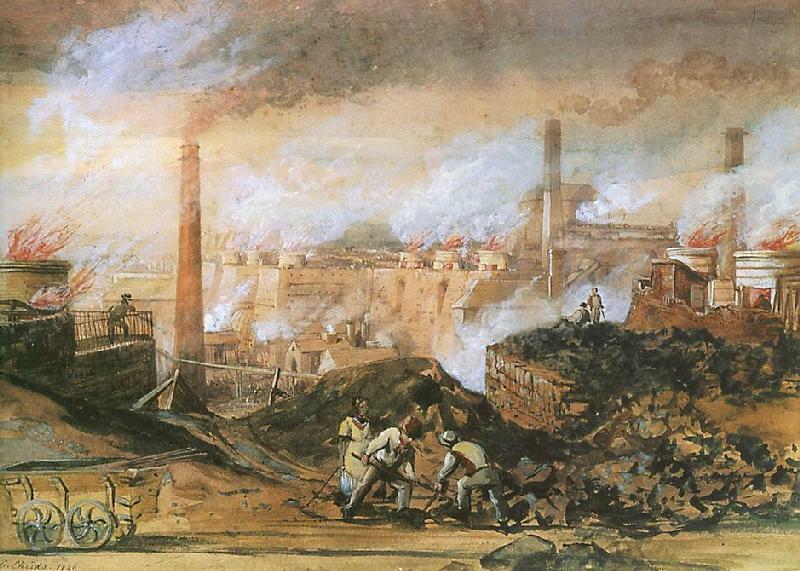 Iron production was already making its mark on the landscape by the late 18th century, and this contemporary painting of the iron works at Merthyr Tydfil, depicts early iron workers and the hazardous job they faced. 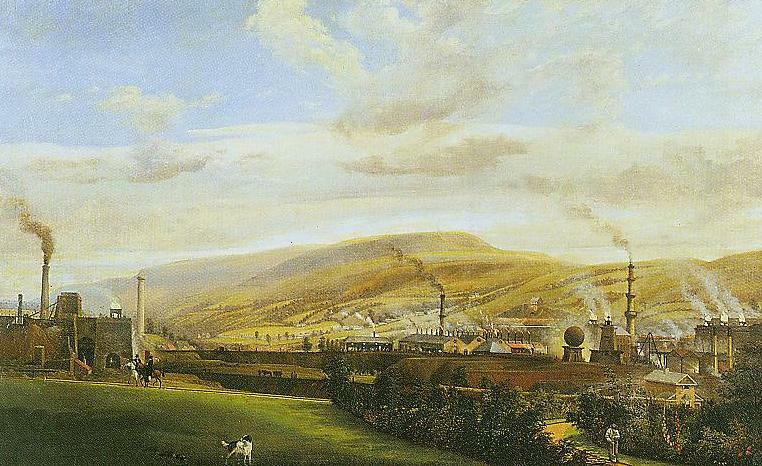 South Wales Industrial Landscape, Penry Williams, c.1825. Typical of the industrial landscapes of the time is this 1820s painting by Penry Williams. 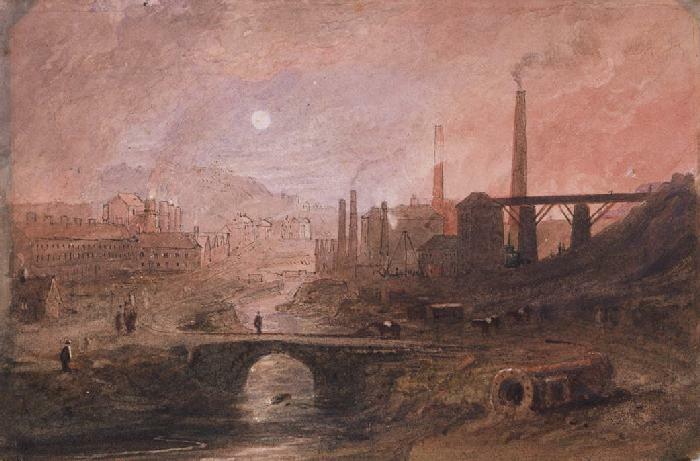 Although the painting's location is not known, the scene depicted here would have been familiar to most of the most of south Wales' industrial workers. 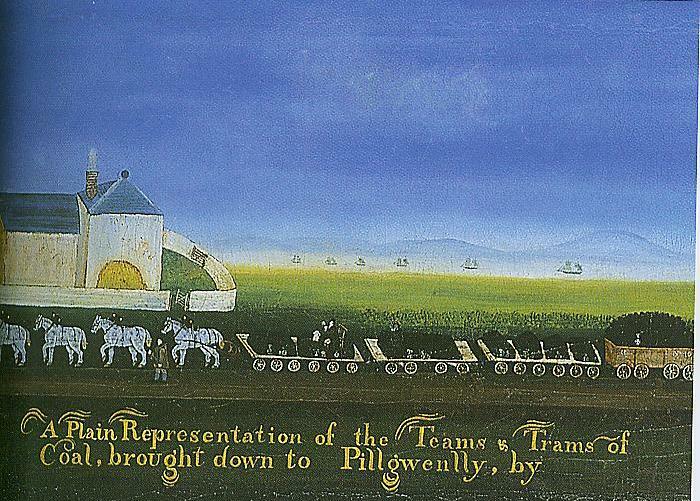 A Plain Representation of the Teams of Trams of Coal, brought down to Pillgwenlly, Inigo Thomas, c.1821. In the early days coal and iron ore were transported via tram cars pulled by teams of mules, and by the mid 19th century tramways and railways crisscrossed much of south Wales. Eventually steam engines replaced mules as the primary means of moving industrial raw materials and finished products in and out of the valleys. 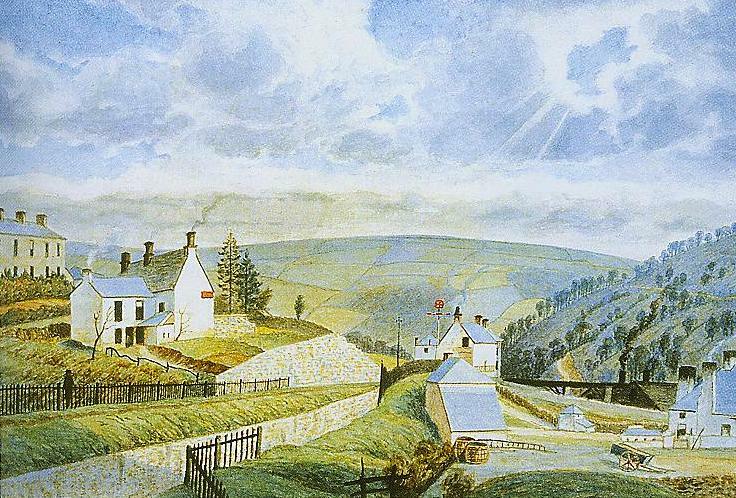 Nant-y-glo Ironworks, (Artist unknown) c.1830. Although the artist is unknown, many feel that this painting is the work of Henry Gastineau, who was known to have painted similar industrial scenes. The subject here is the iron works at Nantyglo. The rapid growth of the nearby town of Brynmawr was due primarily to an influx of workers from the Nantyglo works. Rolling Mills, Thomas Hornor c.1817. Contemporary writers often noted that the sky around Brynmawr was lit up at night by the nearby furnaces at Clydach and Nantyglo, and this painting by Thomas Hornon gives us some idea of this night time effect. In times of high demand, iron furnaces were typically operated 24 hours a day. 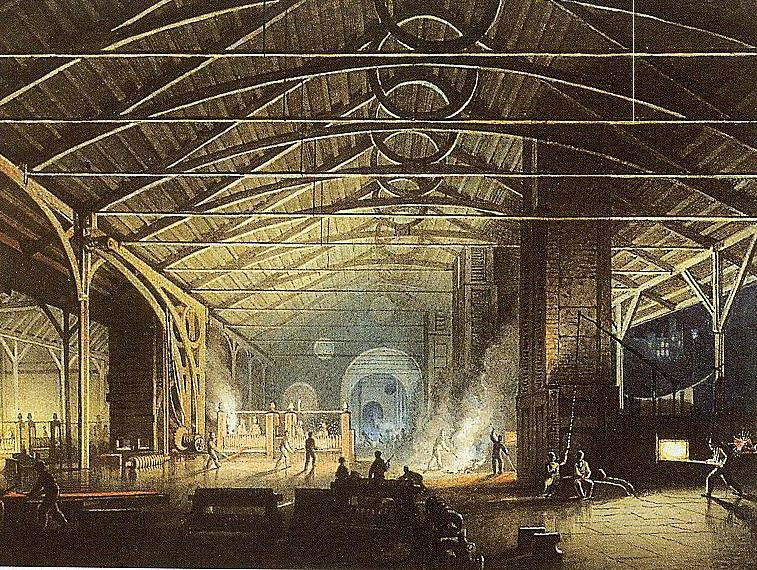 Cyfarthfa Ironworks Interior at Night, Penry Williams, 1825. In this painting we are shown the interior of the Cyfarthfa Ironworks at night. The works, near Merthyr Tydfil, were founded in 1765 and were sold to Richard Crawshay in total in 1794. By the early 1800s it was said that the Cyfarthfa Ironworks were the largest in the world, employing some 1,500 men. Abertillery Tin Works, John Petherick, 1854. The tin works at Abertillery (tin plating) were opened in 1846, and, along with the coal industry, helped transform this once rural community into a bustling commercial center. A second tin works was opened at nearby Blaina about 20 years later. Merthyr Riots, Penry Williams, 1816. 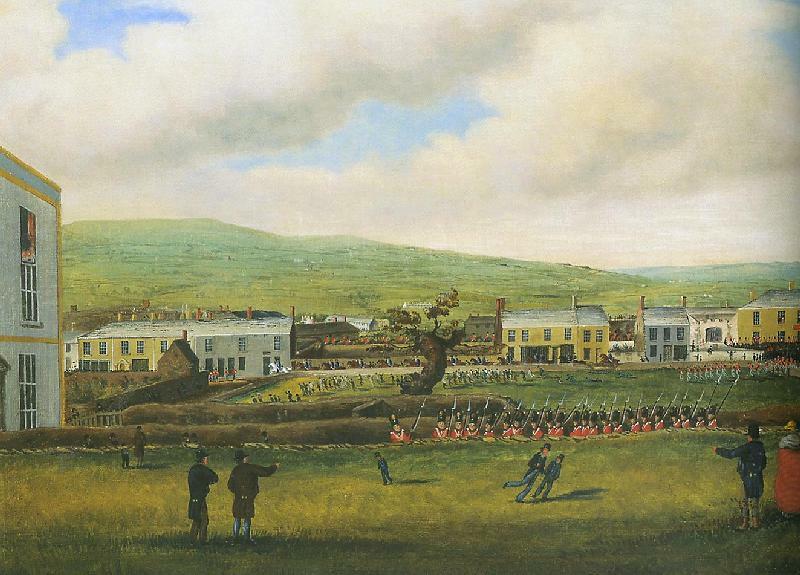 Along with the industrialization of South Wales came the inevitable worker unrest, and this painting depicts the miners strike at Merthyr Tydfil in 1816. The riot eventually grew to include approximately 8,000 workers from throughout the region. Troops were brought in and the riot ended quickly with relatively few casualties (this time). In response, ironmasters Joseph and Crawshay began construction of the Nantyglo Round Towers Complex in order to protect themselves against future worker uprisings. 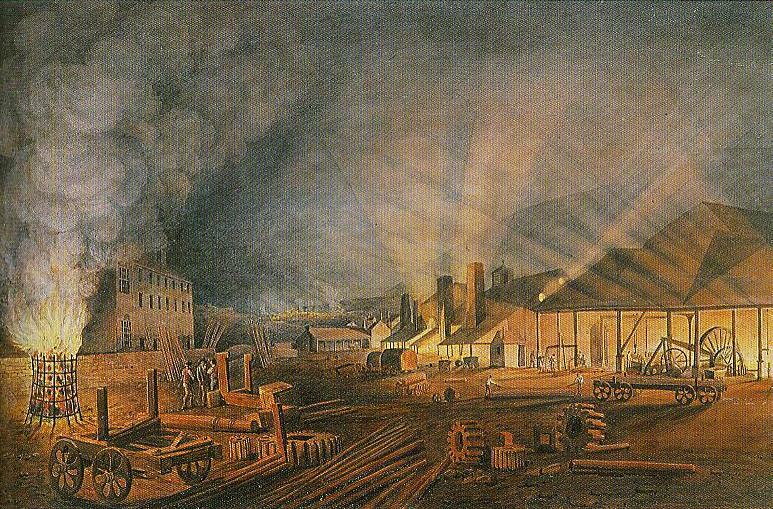 Dowlais Ironworks, George Childs, 1840. The iron works at Dowlais, just north east of Merthyr Tydfil, began production in 1759 and continued until 1930. The works here eventually surpassed those at nearby Cyfarthfa, and by the mid 19th century had become the largest in the world, operating 18 blast furnaces and employing over 8,000 workers. The works attracted large numbers of immigrants from within Britain as well as from other countries. 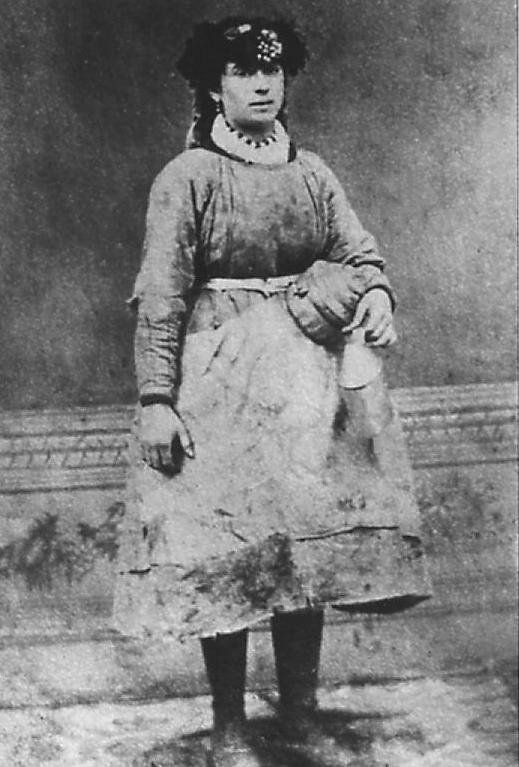 Mine Worker, William Clayton, c.1860. These two well-known photos from the 1860s are thought to be among the earliest surviving photographs of south Wales mine workers. They give remarkable insight into the typical dress of the mid-century miner. Most noticeable if the lack of effective protective safety gear and clothing. 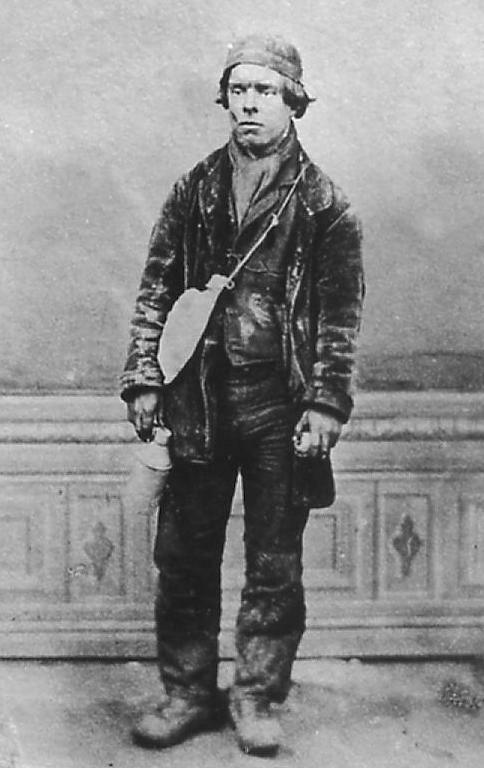 Mine Worker, William Clayton, c.1860. The photograph here reminds us that women too worked in the mines, often as "pit girls," whose job was to pick out coal or iron stone from the pit banks. The women typically carried the coal and iron stone in boxes or baskets on the tops of their heads. 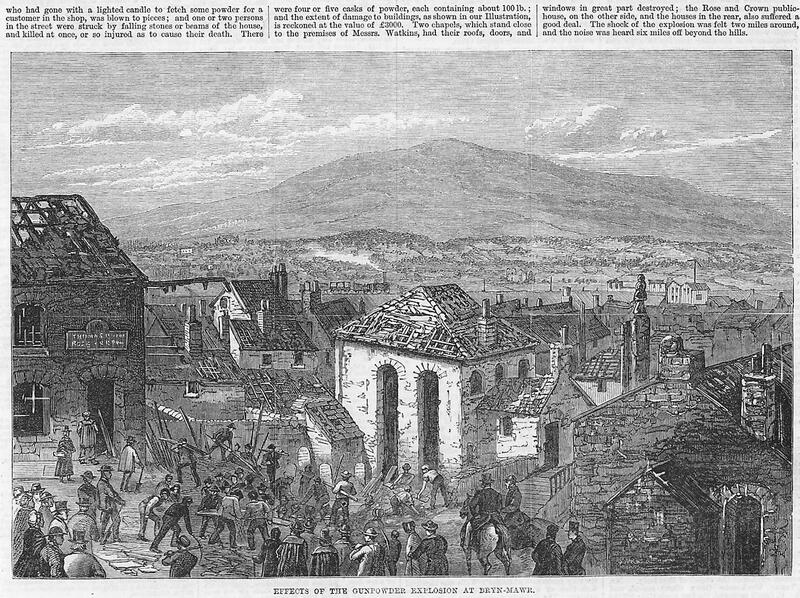 Effects of the Gunpowder Explosion at Bryn-Mawr, The Illustrated London News, January 29, 1870. The drawing here recounts the tragic explosion at a warehouse near Libanus Chapel in Brynmawr. A boy who went to the warehouse to retrieve gunpowder for his master, lit a match or a candle in the dark and the resulting explosion killed the boy and a small girl playing nearby. The explosion was so powerful that several buildings had to be reinforced by iron pins in order to to ensure their safety. View modern photographs of Brynmawr & surrounds.